People often ask me what projects I am currently working on. Here, in the final video in this conversations series, I talk about Puritan: All of Life to the Glory of God and Reformed Systematic Theology (4 volumes, volume 1 coming out in March). Even when Christians affirm Reformed doctrine, they still face the temptation to attract more people to our churches by people-pleasing. Here, in this fifth video in this series, I talk about this grave spiritual danger and how it leads us to contradict our confessed beliefs and eats the heart out of godliness. There are encouraging signs of God’s Spirit working in the church in North America today. However, there are also areas where we need further spiritual reformation. In this video, part four in its series, I highlight three areas of concern: the need to regulate worship by the Word, the danger of worldliness in the church, and the importance of preaching that is biblical, doctrinal, and experiential. What Makes Reformed Systematic Theology Special? We are so grateful to God that Crossway is publishing the first volume of our new book, Reformed Systematic Theology. However, we are well aware that there are many good books of theology already available for Christians. We ourselves often make use of them in our studies, quote them in our books, and thank God for the truths we have learned from them. In this video, I discuss what makes Reformed Systematic Theology special among the various systematic theologies published today. Much of my life has been devoted to learning from the Puritans how to apply God’s Word to all of life for the glory of Christ. The book I co-authored with Mark Jones, A Puritan Theology, explored what Puritan theologians taught on many subjects. Now Reformed Systematic Theology, co-authored with Paul Smalley, presents the biblical truths of Reformed Christianity in a way that draws many theological and practical insights from the Puritans, as well as other Reformers and the ancient church, while applying these truths to our modern context. Why are the Puritans so helpful to us today, four centuries after they lived? This video presents several lessons we can learn from the Puritans to help to know our God and walk closely with him. This video, the third in its series, contains my thoughts about the “regulative principle of worship,” the doctrine that the church must worship God only as he has commanded us. This crucial principle is central to Reformed worship and crucial for protecting God’s people from false worship. Too often, we divorce theology from the study of the Bible, imagining the former to be an academic, intellectual debate and the latter to be a simple acceptance of God’s Word. In reality, there is no true theology without Bible study, and no faithful Bible study without theological reflection. This is one reason why we have written Reformed Systematic Theology. In the video below, I talk about how we study the Bible theologically in a way that keeps theology a means of godliness and the servant the church. Though I was a shy young man when God first converted me, he gave me a burning desire to speak to others about Christ. Yet I needed training and preparation. In this video, the second in its series, I share how the Lord brought me into pastoral ministry and teaching in seminary. Mary and I made it safely from Nevada to Los Angeles, California, where we met up with David Woollin and helped unload all the boxes for Reformation Heritage Books at John MacArthur’s Shepherds Conference. 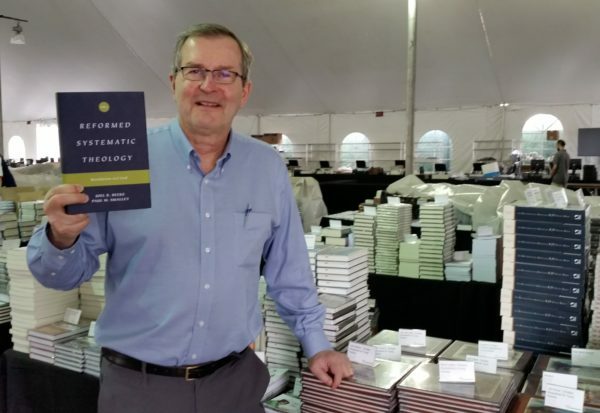 The first volume of Reformed Systematic Theology by Paul Smalley and me arrived here in time for the conference that starts today! Please pray with us that God will bless this book abundantly to many pastors and lay people around the world.